It all started when I was 21 years old. I had just gotten home from working the closing shift at a local toy store. I was having a snack and watching TV, when suddenly an electrical wave washed over me – from my neck to my feet, for lack of a better word, I went numb. I remember thinking, “this can’t be good.” But I did what any logical person would do; I ignored it until it went away. However, the feeling did not go away and after about a week, I couldn’t take it anymore and hit the Internet for answers. “I got it – I have anemia! I just need some iron.” So, off to the doctor I went. He examined me for about 20 minutes, asked me a few questions, and declared that the problem was all in my head. Seriously. Left to figure it out myself, I had another epiphany – issues with the nerves cause numbness, I must have pinched nerves! Off to the chiropractor I went. I had six pinched nerves and after a month of numerous adjustments, I was back to normal. Over the next several years, “pinched nerves” would plague me as well as several new symptoms that seemed relatable at the time. Each time I would return to my chiropractor for a month of treatment, followed by a month of personal rehab to get my strength, endurance and muscle flexibility back. Fast forward six years and my reprieves came less frequent, my symptoms were getting progressively worse, and eventually I was having “attacks” multiple times a year. I was on a steady downward decline. Everything stayed isolated to my right side, I was experiencing greater numbness, my muscles grew weaker and my balance and stamina were failing me. I was having memory, hearing, sight, and speech issues. “Pinched nerves” were slowly consuming my life. I kept pushing through it until 2009 when I experienced two attacks back to back, which had been the worst attacks to that point. You name it, I had it: muscle spasticity, foot drop, and numbness. I could barely move the right side of my body, half of my face didn’t move, I couldn’t get a sentence out clearly, I was running into things because I had no balance, and walking any short distance was exhausting. Eight days and two hospitals later, I knew pinched nerves weren’t my only problem. I had Multiple Sclerosis. I didn’t know what the disease was, but I didn’t think I wanted it. I felt my life was over before it even started. I was afraid of losing my independence. To make matters worse, I was told I would never recover, and would probably be in a wheelchair, bedridden, or dead in 10 years. I was only 32 years old! I was angry – I declared war on my MS! The day I was finally released from the hospital, I started researching. I immediately found Dr. Roy Swank and the Multiple Sclerosis Diet Book. It took me two days to read his book cover to cover. Dr. Swank believed that saturated fat fed MS; so I immediately purged my kitchen of any offending food. As far as I was concerned, saturated fat was killing me and it therefore became the enemy. I started the Swank Diet immediately and never wavered. But, I didn’t stop there…I kept researching. I wanted the latest and greatest information on MS…and that led me to Dr. John McDougall a protégé of Dr. Swank. After studying McDougall’s information, I quickly converted to a starch-based diet, free of all animal products. In the meantime, I landed at the Cleveland Clinic’s Mellen Center for Multiple Sclerosis, a state-of-the-art facility and one of the largest, most comprehensive programs for MS care and research worldwide. When I asked about Dr. Swank and diet, both were immediately dismissed as nonsense. All I was offered was a list of MS drugs (with a longer list of side effects) to choose from. While in the past it had only taken me one month to recover from an attack, it took me six months to recover from the attack that lead to my diagnosis. In the meantime, out of fear, I had also started Copaxone, an autoimmune suppressant drug for MS. I stuck it out for three years until I decided that I wanted off the drug. I decided that I had to talk to McDougall face to face, look him in the eye, and see if he was full of…well you know. I attended McDougall’s 10-Day Live-in Program and asked McDougall to explain to me step-by-step, in layman’s terms, how MS worked and what was going on in my body – something I had been unable to uncover in all my research. When he was done, the answer was clear – it was the food. I stopped taking Copaxone that day and have never looked back. Nearing seven years later, still in remission and drug-free, I have no doubt that it’s McDougall’s starch-based diet that stopped the MS in its tracks. While I was initially determined to get rid of the MS, I have learned that I can’t – it’s just how my body works now. But, I can keep it from “waking up” by controlling what I eat – and that is better than any drug! By learning the right way to eat, I have my life back. I am no longer waiting for the next attack. While I still think of it daily, MS no longer consumes my life. The last question I asked Dr. McDougall was what I should do next (to help with the MS). He told me to go live my life…I took his advice to heart immediately. Since getting my health and life back, I have become a plant-based health advocate in my own way. 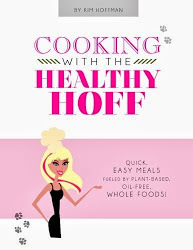 I started the Healthy Hoff, a holistic health & wellness blog dedicated to the vegan lifestyle. I published my own whole-food, plant-based, oil-free cookbook and I am now a certified Health Coach dedicated to helping others Beat MS. Thank you Dr. McDougall. You not only changed the course of my life…you saved my life. Thank you for all your hard work – never stop fighting to get the truth about food out to people so that you can help the next person.